Great American Music broadcast live worldwide from The Aud in historic Downtown Eureka Springs in October. 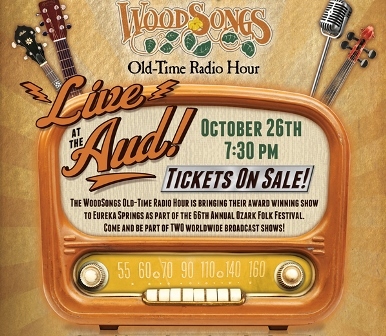 WoodSongs Old-Time Radio Hour is broadcasting during the 66th Annual Ozark Folk Festival October 23-27. Dance to Hellbenders at the famous Barefoot Ball in the 1905 Basin Park Hotel. Hear live music from the Basin Park Bandshell, enjoy fabulous food, a downtown parade, beautiful fall weather and so much more. Tucked deep in the Ozark Mountains, Eureka Springs is a mountaintop destination with world class spas, unique shopping, independent fine restaurants and neighborhood pubs and lots of interesting attractions and things to do. Enjoy the journey. Driving to Eureka Springs offers some of the most scenic views in the state of Arkansas. Ride the famous Pig Trail, follow the Arkansas Art Trail or discover a new motorcycle route. 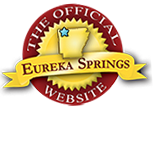 See a full listing of Eureka Springs Lodging and look at upcoming events on the Official Eureka Springs Calendar of Events. This entry was posted on October 4, 2013 by estcblog in Arts & Culture, Basin Park Hotel, Fun Downtown, History, Musical Adventures, Road trips, Things to Do and tagged Arkansas, Eureka, Eureka Springs, Eureka Springs Arkansas, Official Eureka Springs Calendar of Events, Ozark, United States, WoodSongs Old-Time Radio Hour.